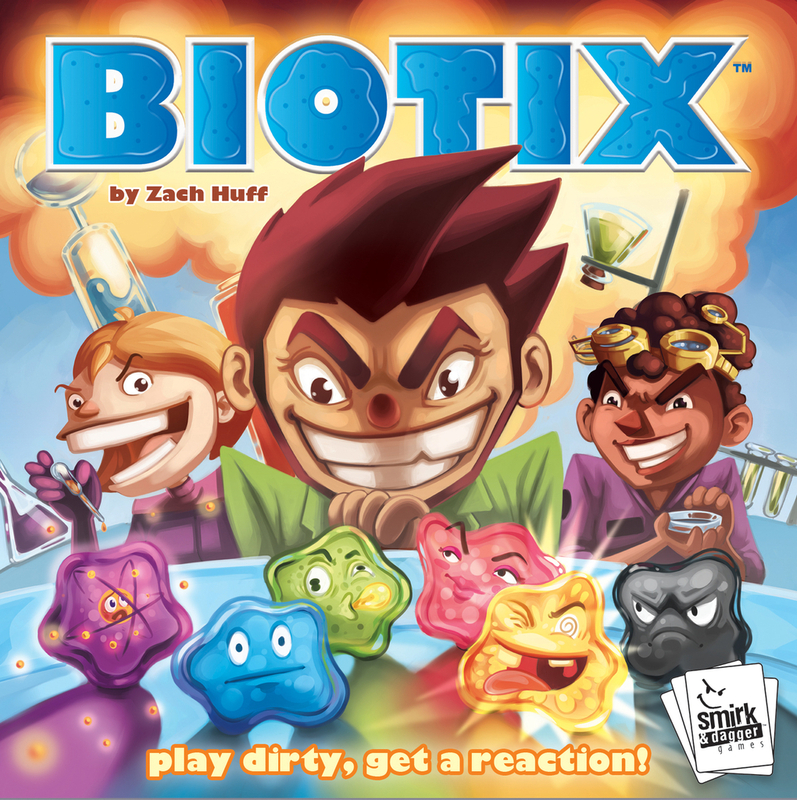 BIOTIX is a game by Zach Huff, published by Smirk & Dagger Games. It is for 2-5 players. In this game, players will take on the role of lab assistants to a world renown microbiologist. They will be trying to grow a culture of highly unstable and volatile biotic microorganisms, known as BIOTIX over the course of 3 days of research. Of course they’ll have to watch out as they’re fellow lab assistants may try to sabotage their experiments to cause a bio-reaction or even an explosion which can have all kinds of repercussions on their culture of BIOTIX. In the end, the player that can score the most points, thereby publishing the best paper on BIOTIX will be declared the winner. To begin, each player is given a petri dish card which should be placed in front of them. A characteristic card should be placed between players for reference. All of the blue, red, green, purple and yellow BIOTIX should be placed into the specimen bag. The black BIOTIX are not to be used except with the advanced game. The first player is chosen. They are given the timer token which they will then place on the 3 spot of the countdown track on their petri dish card. They are also given the specimen bag. Play now begins. On a player’s turn, they will draw 2 BIOTIX at random from the specimen bag. They will then place the BIOTIX they drew, one at a time onto either their petri dish card or they may give them to an opponent who must place it on theirs. Every time that a BIOTIX is placed on a petri dish card, the player must check to see if there are any bio-reactions. These happen whenever there are more BIOTIX then there are spaces to place a particular color. This is known as the trigger number. Players must then resolve the effect of the particular BIOTIX type as noted on the characteristic card. This may cause chain reactions and each reaction must be resolved before resolving a new reaction. Once there are no more reations to resolve, the player passes the specimen bag to the next player in turn order. It should be noted that each time the player with the time token on their petri dish card receives the specimen bag, they should advance the time token on their card one space. When the time token moves off the 1 space, it is placed into the specimen bag. This happens before drawing new BIOTIX. The game continues until the timer token is drawn from the specimen bag. When this happens, it signals the End of the Day. Any BIOTIX tokens that were drawn with the timer token are trashed. Any time a BIOTIX is trashed, it is placed into the bio-containment box where it is hidden from sight. The player that drew the token then places it on the 3 spot of their countdown track. 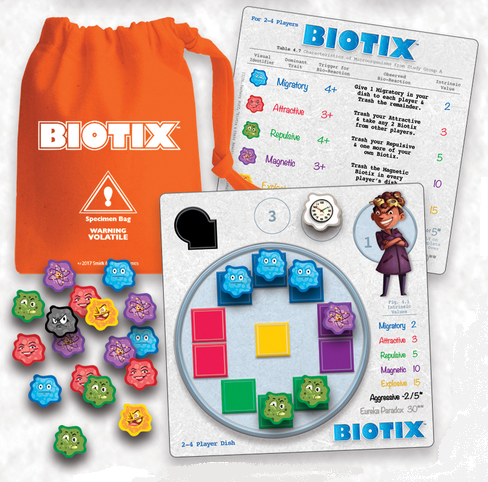 Player will then score the BIOTIX that they have cultivated on their petri dish by adding up the points for each as noted on their petri dish card. This should then be written down for each player on a scrap piece of paper. Players will then choose 2 BIOTIX on their petri dish card and trash them. All BIOTIX that were trashed and any placed into the bio-containment box are then placed back into the specimen bag. The bag should then be shaken vigorously to shuffle up the tokens. The specimen bag is then given to the player with the timer token on their petri dish card. A new day of research will then begin. This continues with players taking turns, placing BIOTIX and resolving reactions until the end of the third day of research. At this time, players will add up their scores from all 3 days of research and compare them with the other players. The player with the most points is the winner and gets their name attached to the published research paper. The game comes with some fun and humorous looking pieces. There are 6 different types of colored BIOTIX. These are brightly colored wooden pieces that must have a sticker placed on each one. I love the silly and fun look that each of these has. However, it does take awhile to place the stickers on these and it doesn’t hurt to have steady hands as the pieces are a little bit small. There’s also a timer token that is just like the BIOTIX tokens except that it’s white. It too must be stickered. These all go into the specimen bag which is a really durable nylon type bag that is quite nice. Also included with the game are several petri dish cards for each player, as well as the characteristic cards. These cards are large and have colored places to put the BIOTIX on. It even looks like a petri dish on the card. The characteristic card explains what the trigger number for each BIOTIX is and what the reaction is when it reacts. Both of these card types are a little thin but as they aren’t shuffled or anything, they work quite well and should last for quite awhile. Now I must mention the mispacked game insert. I have to admit, when I first opened the box I thought, “MAN! They really got thematic with this game!” It was a bit later when I realized that the insert had been put in backwards. Instead of being a cover, it should have been like every other insert and simply been placed inside the box. After a bit of refolding, the insert went into the box like it was supposed to. Overall, the silly humor of the game comes out in the tokens and petri dish cards. I quite like the look and the feel of the game. The rulebook for this one is pretty good. It’s pretty much straight forward and to the point. It isn’t too large and doesn’t take a long time to read through. There are several pictures and examples througout the book. There are also a couple of variant rules, including a 2 player version of the game, as well as an advanced version that introduces the the Black agressive BIOTIX. There’s also a nice sequence of play that can be used as a reference for playing the game. Overall I found nothing to be difficult to understand. It’s well written and gets the job done rather well. This is a really fun and chaotic game. It’s pretty simple to play. Simply draw a couple of tokens from the bag and then place each one on either your own or one of your opponents petri dish cards, resolving each as you place it. It’s when you have to place that token and there’s no more spaces open to be able to place it, that the chaos and fun really kick in. That action will then kickstart a chemical reaction that the player has to resolve by following the instructions on the reference card. Of course, when that reaction is done, it may have created another reaction, that will create yet another action. It’s not unlikely that there can be a huge chain of chemical reactions for you to have to resolve. it can be frustrating and pretty funny too. In the overview, I mentioned the advanced game that includes using the black BIOTIX. This really puts a new spin on the game and can be quite nasty. Players can really mess each other over because each one of these BIOTIX causes you to lose 2 points for each one that’s on your petri dish. However, if you aren’t careful a player can completely fill up their board with them and score 5 points each. That’s if they have no other colored BIOTIX on their board. It’s kind of an all or nothing type of play. Needless to say, I haven’t been able to pull it off yet. Overall, the game has a lot of player interaction to it and a bit of a take that feel as well. Fans of games like Munchkin should enjoy the chaotic fun of this one. I would recommend this game, especially if you have kids. Kids will really get a kick out of it. BIOTIX is a take that style game set in a laboratory. It’s a pretty quick game with most game sessions lasting around 30 minutes. The components are all great. They’re quite funny and fun to manipulate. I like how great everything looks, however it does take awhile to put all those stickers on. The game is really simple but is full of chaotic fun. It’s quite simple to teach and learn. The game is especially fun for kids. They really seem to enjoy the silliness. The advanced game adds a bit more to the game without adding a lot of complexity. Fans of games like Munchkin or other take that style games should enjoy this one. I would recommend this one, especially for playing with the kids. It’s hazardous to your funny bone. For more information about this and other great games, please check out Smirk & Dagger at their site. This entry was posted in Reviews and tagged biotix, board, board games, card, card games, dagger, games, huff, smirk, smirk & dagger, smirk & dagger games, smirk and dagger, zach, zach huff. Bookmark the permalink.